Due to modern designs and the use of high-quality materials and components, Speck pumps can be used under extreme operating conditions, (example at temperatures between -90°C and +350°C). The modular design offers a major advantage and facilitates an application-specific customization of liquid pumps and liquid ring vacuum pumps. For example, you can choose between pumps with conventional sealing systems and seal less versions. Thanks to Speck Pumpen’s research and development Speck’s product range is continuously growing. 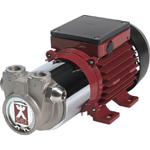 Speck industrial product line includes: Small pumps, Heat transfer pumps, Side channel pumps, Boiler feed pumps, Liquid ring vacuum pumps and Staged centrifugal pumps.